*** SERVER ISSUES *** - we are currently experiencing a heavy load on the server that we are attempting to resolve. Slow loading may occur until we have this puzzled out. everything seems back to normal meow. I'm getting the following pretty much every day now when I try to visit the forums. It seems to depend on the time of day, the site is usually fine after 15:00 CEST or so. Our top guys are on it. Why hasn't the ScottBot just jacked into the server with his KADE neural interface and diagnosed the issue? I'll create a GUI interface using Visual Basic...see if I can track an IP address. something in the user database seems to be boggin things down. This is the greatest thing I've watched on YouTube in a while! Thank you. boy she is sloooow today. took me several minutes to get to this thread and reply...and that was after i spent 5 and gave up on reading a message in my inbox. is it time to nuke and start over? has been going on for a few weeks,just like someone through the power switch.? i agree time to nuke it and start over ? I hate to jump on the complaint train but dang Saint.... Let's figure it out, make everyone pitch in a dollar for posting privileges or something but just get it fixed. Did this thread get post helled? Nice.. I can see it. Woah. It does that every night now between 10 and 11 PST. It's been particularly slow the last 48 hours. In some cases, the forum simply never loads. I'm not going to complain about something not working when it is FREE to the community. Make everyone donate $1 or $2 to post. Not only does this generate money to keep the site hosted, but it will also help keep the spammers out. In turn, it might make the mods life easier too. They would only have to approve accounts that have already donated. Instead of approving every new post that comes in. Make everyone donate $1 or $2 to post. Someone start a gofundme for pbj. Most forums I'm a member of just periodically ask for donations to help pay for hosting and forum software updates. when did we update SMF to 2.0.11? is there something in that update that broke the forum? some pages load fine *snap* like that, others..... ticktockticktock if at all. best guess, its MySQL related and probably more specifically, and issue with the database. 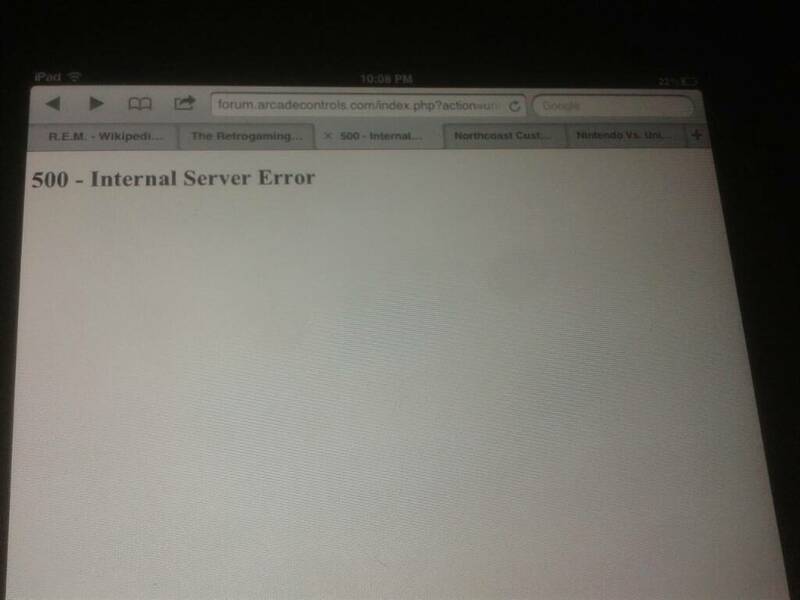 error 500 internal server error ?? Saint, anything we can do to help with the recent issues? In Brisbane, it's GMT+10 all the time. I just saw a slowdown at about 3-4 mins past the hour, but it's come good again. It's just now a little past midnight US Eastern. In the next couple of hours if history is a guide, the site is going to slow again and then throw 500 errors. Those tasks are possibly creating a queue on MySQL. Check for active queries while the site is slow. If the database user has the necessary privileges this will braindump the active db queries. Things to look for are the lines with "Time:" and "State:" -- if there are heaps of rows and they're slow, well, yeah, database bottleneck. The queries themselves might give a clue exactly WHAT it's busy with, which might lead to some ideas about shifting that activity to some other time etc. Check for any spikes in site traffic. Count rows per minute in the web server's access.log file, look for any spiky patterns for IP addresses or User Agents. Could be as simple as something set to crawl the site at the same time each night. Scratch-built Aussie cocktail. It's big. It rotates. Speaking of donations, I agree with this idea. Saint, set up a Patreon. I'd pay a buck or two a month to keep this place running. I'm all for throwing money at the problem, but that does no good if saint's TOP MEN don't know what the problem is. It took five minutes of page refreshing to post this comment. Reminds me of a former IT director we had who swore unequivocally that if there were any issues, "we'd have boots on the ground in 15 minutes." Lots of minutes went by with no boots ever. I'm gonna guess that the problem is in the SQL database. I had this issue when I was using velcom. I switched my server to Liquidweb and the problem went away. Also velcom did not update their php myadmin panel often enough and I was compromised by a mid eastern hacker. I'd seriously consider changing servers. It seems the issue is constantly happening. Bartop "BAR-CADE" project My 3rd attempt. I would seriously look at the Burning Board software. It is not free but they have excellent technical support. I had their services when I ran CS gaming boards. I would donate $10 or $20 a year for a new server platform. You have to look at the benefits BYOAC has to offer, and what we have been receiving for free over the many years. Migrating an application of this size and age off Simple Machines Forum to another application like Burning Board is likely a thousand times more work and risk and cost, than getting the hosting stabilised. Saint's running the latest stable version of SMF which demonstrates someone at least is doing the right thing and keeping it up to date. I'd suggest passing the hat around is not a bad idea, with the goal of engaging the support required to diagnose, then repair or migrate the hosting depending on what's actually failing. If your worried about moving to another platform, just do like I did and install XAMPP on your local drive then copy the entire forum and database and convert from there. I know there are tons of converter tools for PhPBB, vBulletin, SMF, UBB, IPB, MyBB, XenForo, etc, etc. SMF is nice because of the hook system when installing MODS, but it tends to be pretty taxing on the SQL. My personal preference would be PhPBB because it is so easy to work with. I've had no problem at all creating my own MOD's for it, even have a couple of them listed in the PhPBB MOD database. Not to mention there are tons of theme's available for it, and creating theme's is a breeze too. One of the forums I owned had 500 plus sub forums (newsucks500.com now under new ownership and new platform), which, on most any other software, can really overheat those SQL database tables. PhPBB was able to handle it all just fine with no slowdown or crashing. Something I never would have attempted with SMF. In fact, the largest forum on the internet (gaiaonline.com), is nothing more then a heavily modified version of PhPBB. Hey everyone - I appreciate it, and I'm sorry I haven't been responsive here. We're not on a hosted platform, I lease the entire server. It's going to take some more time. The person I've asked for help has their own life/work/family responsibilities, so time on fixing the server has to compete with that. If they aren't able to assist, in a couple of weeks I will start working 4x10 work weeks with 3 day weekends, and that will give me the extra time to purchase and start configuring the new server. I appreciate everyone's patience and concern. If all else fails I will throw up the white flag and ask for additional help from the forum. For security's sake I am cautious about who I give access to the server directly, because it has your information on it in some fashion, but the option is on the table if needed. Thank you Shock, I'll dig into these. While it's slow all day, it *is* consistent on when it finally gives up the ghost each day. For any Linux (particularly Ubuntu) gurus out there, here is what a random sampling of iotop shows while the forum is running. The various bits that are showing up in the top change about 1-2 times per second. In a few minutes, I'll down the web server and mysql, and capture a few iotops while they aren't running for comparison. Unfortunately, I don't have a baseline to know what is and isn't normal. Page created in 0.147 seconds with 61 queries.